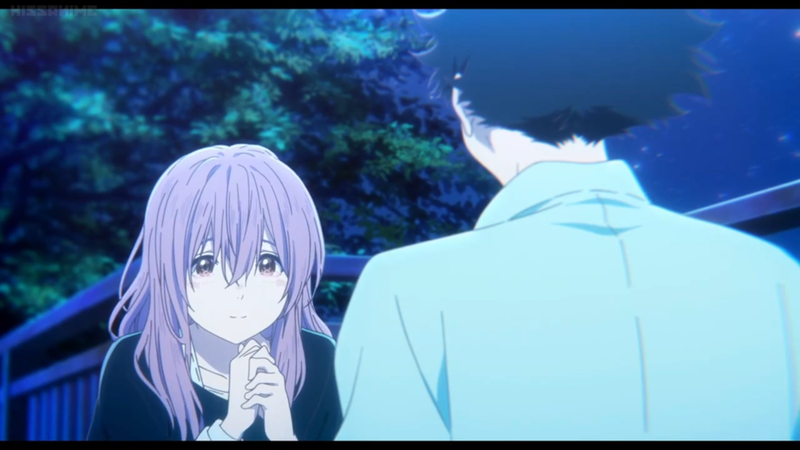 The highly anticipated film "Koe No Katachi" or "A Silent Voice" by Reiko Yoshida and the Kyoto Animation team, finally made its way to the web for online viewing. I personally have been waiting patiently for this release and I must say the film was amazing. The story is about a boy named Ishida Shouya who along with his fellow classmates, introduced to a girl named Nishimiya Shouko. Ishida and the others learn that Nishimiya is deaf and can only hear a small amount with her hearing aids. During the beginning stages she carries around a note book which she uses to communicate in hopes to be friends with everyone. Though Ishida constantly bullies Nishimiya because of her disability by calling her names, playing jokes, and destroying many of her hearing aids. It gets too much, and she doesn't return back to school. All fingers were pointed at Ishida when the teacher confronts the whole classroom about the situation with Nishimiya not returning. Ishida's so called "friends" then bully him the same way he had bullied Nishimiya. Now an outcast, it causes Ishida to shut everyone out from his life. Fast forward a few years later, while in the school halls he runs into Nishimiya, who is now much older. Ishida is reminded of all the terrible things he's done to her and gets her attention to become friends. She can now speak but it's not too well so instead of the notebook she was using in the past, she now uses sign language to communicate.